Joidiamonds is a premiere freelance graphic and web design company based out of Atlanta. We have everything to fit your needs. We specialize in logo development, web designs and signature brand marketing. Take a look at the service page and see if there’s a package for you. Can’t find the perfect page? Then get in contact for a FREE QUOTE. 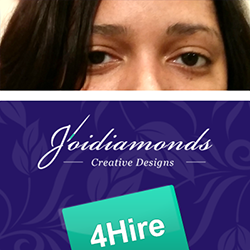 I’m Crystal and I’m a certified freelance designer and I am the founder of Joidiamonds. I’m here and ready to put the “Joy” in your brand. ..“Joy”…. you get what I did there right? *giggles* Ya know.. “Joi” -diamonds? Okay, so that was corny, but there was no easy way to work that in! HA! At the least, we can walk away knowing you know, how properly pronounce it! I have two loves, animals and art. Around ’03 a friend of mine suggested I go into graphic design… so I did. (Apparently), it doesn’t take much.. HEY, when an idea is good, GO FOR IT! I did what was needed, and learned as much as I could online. After a few years I branched out, and started taking classes at a local college to get certified; and now I even do web design!! My immediate goal is of course to complete a BA, and my long-term goal is to start my own design firm. For me, creativity is no limits, and endless possibilities. Take a seat back, look around, shoot me an e-mail, or add me to Skype. I’d love to work with you and help take your project to the next level!